MOSLEY STREET is named after local landowner and Lord of the Manor, Sir Oswald Mosley. It was once a fashionable residential street, but by the 20th century it had become a place of banks, offices and shops. This attractive street sign is carved into the stone and is part of the new Lewis's building, put up in the 1920's. 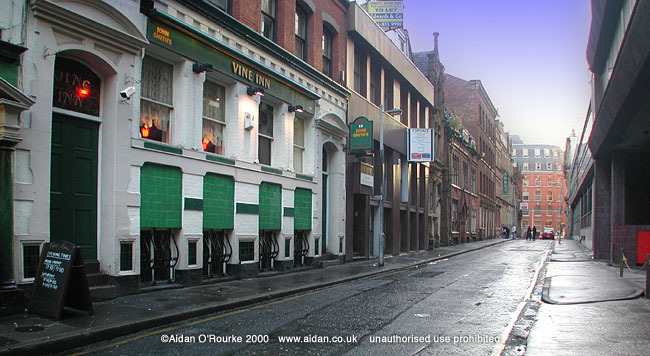 It's situated at the top of Mosley Street, at the junction with Market Street. And did you know that the football league was founded here? I didn't until I saw the plaque. 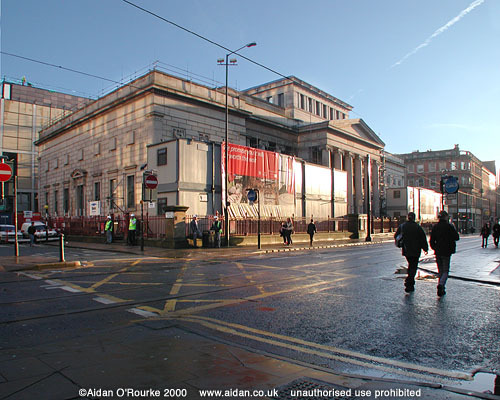 THIS FAMILIAR VIEW is set to change with the redevelopment of Piccadilly, taking place in mid to late 2000. Under the plans, the statue of Sir Robert Peel, founder of the police force, is to be removed. This statue has stood here for over 150 years. The stone inscription reads: "W. CALDER MARSHALL R.A. SCULP. LONDON 1853". 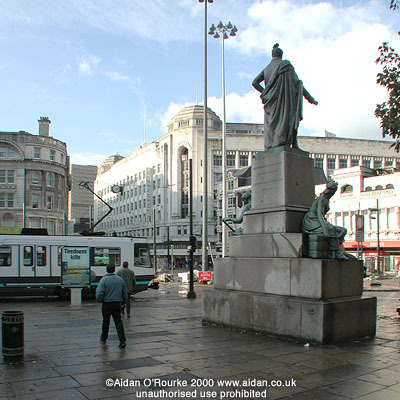 On the left we see a Metrolink tram which is snaking its way round to Piccadilly Gardens tram stop. 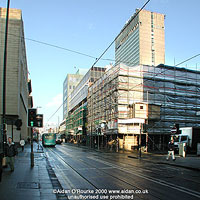 In the centre we see Debenhams department store, formerly Pauldens and before that, Rylands. On the right is the former Lyons coffee house, now home to Our Price records. 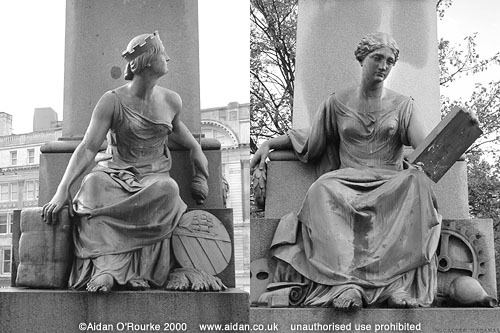 THESE TWO LOVELY LADIES who sit on the base of the statue of Sir Robert Peel (1853) commemorate Manchester's power and influence during the mid-Victorian period. The figure on the left, with the city of Manchester coat of arms, symbolises the cotton industry, while the one on the right celebrates Manchester's engineering industries, as well as arts, letters and learning. 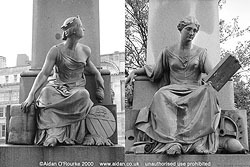 Under local authority redevelopment proposals drawn up in 1999, the statue of Peel, including these figures, is to be removed. PICCADILLY IN NOVEMBER 2000 is undergoing radical redevelopment. 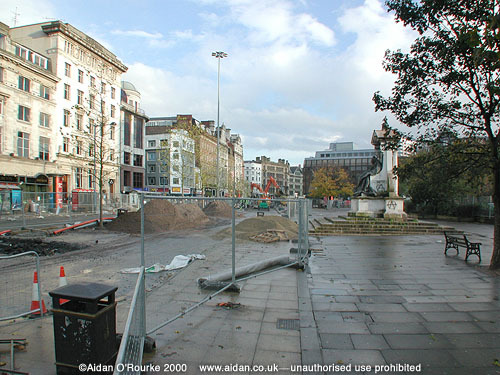 The old flagstones are being taken up, to be replaced by honey-coloured paving stones, set at an angle to the street line..
Small trees have been planted all along Piccadilly from here to Piccadilly Station approach. Only recently planted, they have now lost most of their leaves. On the right is the Queen Victoria statue, and on the left, the building which once housed the BBC's northern studios. 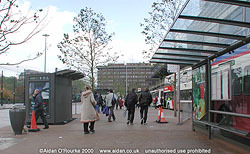 PICCADILLY remains an important bus terminus under the current redevelopment plans. 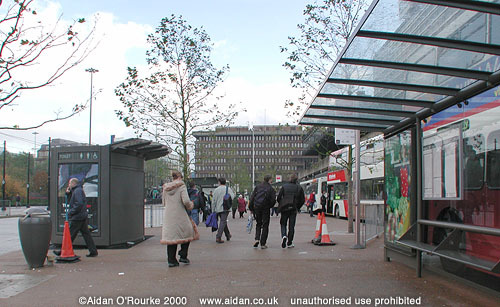 In this picture we see new items of street furniture which have only just been installed: The new millennium-style waste paper bin, like an upturned teardrop, a new design of superloo, trees, and new bus shelters. There used to be a large covered bus station building here - it was put up in 1958 and taken down with the arrival of the Metrolink tram system in 1992. PICCADILLY PLAZA, completed 1965, was the first post-war shopping and office development in Manchester. Here we see it from three angles at the Mosley Street end. The smaller building, with the unusually shaped roof is Bernard House, and the larger block is the Sunley Building. Bernard Sunley was the name of the boss of the development company which created the Piccadilly Plaza. By the 1990's, Piccadilly Plaza had deteriorated - as we can see, Bernard House is structurally unsound - the roof is supported by scaffolding. Under redevelopment proposals drawn up in 1999, the Plaza will receive a complete make-over, and Bernard House will be taken down. WE ARE ABOUT HALF WAY DOWN MOSLEY STREET looking up towards Piccadilly. Behind the scaffolding, the Portico Library is undergoing an exterior cleaning job. The Portico Library was built in 1806 and designed by Thomas Harrison of Chester. On the left is the Royal Bank of Scotland extension. The Sunley Building rises above the Portico Library on the right. 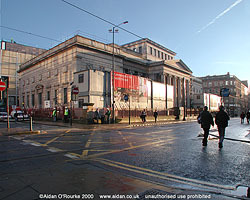 After the coming of the Metrolink in 1992, the street was designated for use in both directions by trams, as well as buses and taxis going towards Piccadilly. THE CITY ART GALLERY was closed in 1999 to allow major refurbishment and extension work to take place. The exterior cleaning work has been completed, though portacabins used the construction workers, are still in place in front of the building. The City Art Gallery was (1825-35) was designed by Charles Barry. 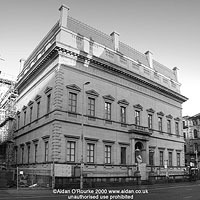 THE ATHENAEUM is on Princess Street, just round the corner from the City Art Gallery, and was also designed by Charles Barry. In the 1930's it was acquired for use as an art gallery. The new extension is in late 2000 under construction on the site directly behind this building. KENNEDY STREET is about two minutes walk from Mosley Street, and runs parallel to the section of Princess Street overlooked by the town hall. Kennedy Street is interesting due to a succession of old buildings, some of which are derelict, and some which have been superbly restored. A proposal to redevelop the derelict buildings, including a block several storeys high, was rejected. IN NOVEMBER 1999, heavy rain fell in many parts of the UK, including Manchester. Here we see the River Irwell, looking from underneath Blackfriars Bridge towards Albert Bridge. A new luxury hotel is under construction on the Salford side of the river. Just to its right is the Inland Revenue building. As we can see, the water level is high, but thanks to flood defences put in further up the river in the post war years, flooding hasn't been a problem. 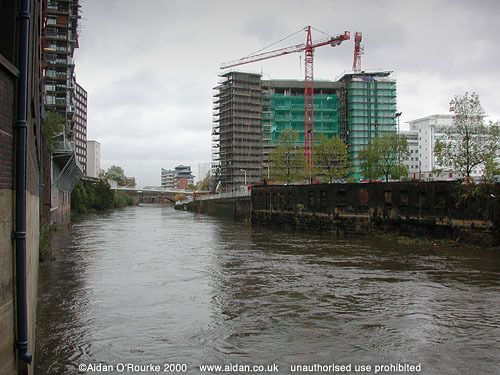 Up till the 1950's, the Irwell regularly caused flooding in some parts of Salford. 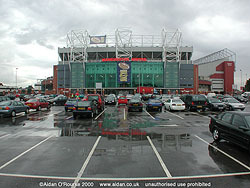 THE NEW MANCHESTER UNITED STAND is seen here during rainy weather, looking from the car park. It's a suitably imposing home for the most expensive, and perhaps most famous football club in the world. On the ground floor of the stand is the Manchester United shop, where you can buy all types of MUFC merchandise. A temporary shop was housed in cabins on the car park whilst the new stand was being built. DURING THE BAD WEATHER of October and November 2000, the River Mersey burst its banks at Ford Lane, Northenden, cutting off Didsbury golf course and closing the bicycle and walking route between Didsbury and Northenden. Further down the river, sluice gates were opened at Sale Water Park, allowing thousands of gallons of river water to be stored without flooding houses. 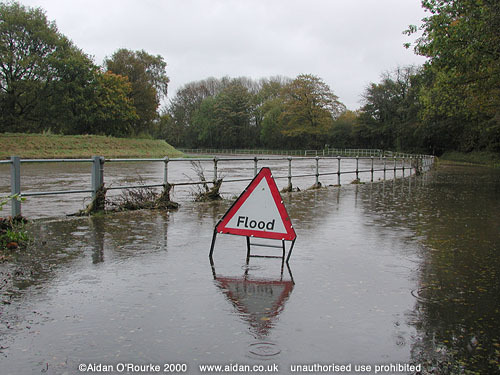 Thanks to high banks built along the River Mersey between Didsbury and Sale, flooding has been limited. MORE PICTURES and mini-articles from Manchester will be added shortly.